The operation aims to reduce the recovery time by freeing the joint to gain full range of movement and reduce pain. 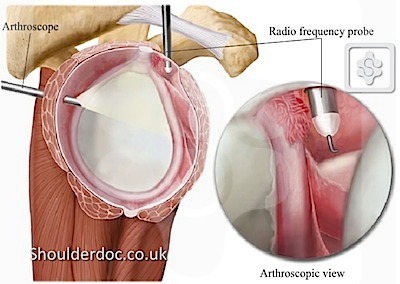 This is keyhole surgery where the tight capsule of the joint is released with a special radio-frequency probe. Traditionally a manipulation under anaesthesia (MUA) has been the surgery performed for Frozen Shoulder . This involves freeing the shoulder by manipulating it under a general anaesthetic . It has been an effective operation for most people with simple frozen shoulders. However, the capsular release is performed with increased precision by key hole surgery, and is called an arthroscopic capsular release. The results are successful in over 80% of patients and the freedom from pain is quicker than MUA. 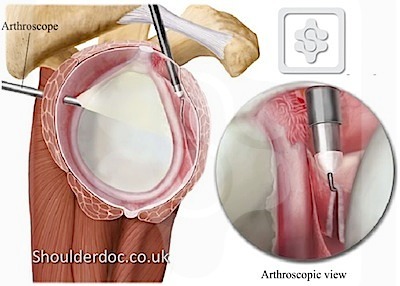 Arthroscopic capsular release also allows the surgeon to look around the shoulder joint with the arthroscope for any other lesions or injuries. Capsular release is safer and more effective than MUA for people who have developed a resistant stiff (frozen) shoulder after injury, trauma or fractures, as well as for diabetics. A special radiofrequency thermal probe is used to cut and remove abnormal capsule tissue. The tight, constricted capsular ligaments are cut, thus freeing the joint again. You will return from theatre wearing a sling and/or Cold compression wrap . This is for comfort only and should be discarded as soon as possible (usually within the first 2 to 4 days). 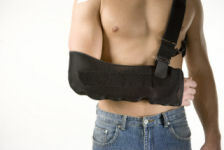 Some people find it helpful to continue to wear the sling at night for a little longer if the shoulder feels tender. Sleeping can be uncomfortable for a while if you try and lie on the operated arm. We recommend that you lie on your back or on the opposite side, as you prefer. Ordinary pillows can be used to give you comfort and support. Some degree of discomfort is common after surgery. You should not have to 'put up' with pain. You will be given painkillers and anti-inflammatories from the hospital. The Cold compression wrap also helps reduce inflammation and pain. This will depend on your occupation. If you are in a sedentary job you may return as soon as you feel able usually after one week . A follow up appointment will be made for approximately three weeks after your operation. The amount of physiotherapy will depend on your individual needs. At three months after your surgery your symptoms should be approximately 80% better. It can take 6 to 9 months to fully recover and you will continue to improve for up to a year following the procedure. Physiotherapy is essential after the operation, to encourage good movement, help with pain management and rehabilitate the muscles back to normal function. You will need to see a therapist within a few days of the surgery. This should be arranged in advance of the surgery. A list of therapists with an interest in shoulders can be found here .